It is a war out there. Life is filled with land mines, snipers, aerial attacks, armadas of enemy ships and a military host of evil that is uncountable. The greatest danger is this enemy is unseen, silent and more deadly than any force known to man. Leading this charge is the dragon himself and the accuser: Satan. There is a war going on and since the Garden of Eden, the war rages on over the face of the earth with lives numbering Legion falling prey to the subtle victories of the devil. Nations are destroyed as the evil of Satan permeates the moral fiber of society. Heroes of scripture also fell prey to his devices. Families are torn apart by the vicious putridity of immorality seeping into their hearts. Fiery darts of evil fill the skies as the hosts of wickedness engage in a losing battle of dominance and defiance. There is a war going on but the victory is already assured. In the final part of Paul’s letter to that great bastion of truth known as the Ephesian church, he reminds the saints of the terrible battle that must be waged each day. The wiles of the devil are powerful with the principalities, powers, world-rulers of darkness, and the spiritual hosts of wickedness in the heavenly places attacking every day. This is a real battle that has been raging since the beginning of time and will continue until the final day of judgement before the throne of God. In the meantime we must fight. We are the victims and we can overcome. The victory has been guaranteed by the resurrection of Jesus Christ and every man has been given the armor of God to protect them from the savage attacks of the devil. Every part of the armor is designed to deflect the power of Satan repelling his advances so that man can remain safely protected from harm. It is a powerful armor. Whatever Satan throws against it will be defeated. Everything! It protects the waist, the heart, the feet, the head and the whole body. Victory is granted because of this armor. Satan will run in defeat when he sends his army against this armor. The sword of truth will slice through evil like a hot knife through butter. Forged by the blood of Jesus Christ the armor of God is complete, perfect and enduring. The design is perfect and its function complete. 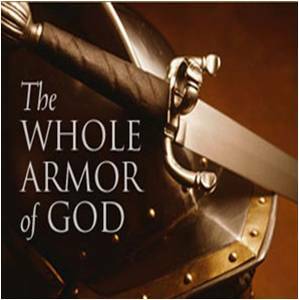 Nothing Satan has will defeat the armor of God – except one thing. The most powerful armor known to man in all of the history of man is useless … if it is never put on! The greatest tragedy of man’s history is to know God has provided protection from the devil and most refuse to put the armor on. Without this armor, death is certain. Among the army of God there are many who believe they are protected because they wear a name. No effort is put forth to wear the armor of God. Sadly, their lives are filled with heartache and sorrow because of sin. To be strong in the Lord and in the power of His might REQUIRES putting on the armor of God to be able to withstand the wiles of the devil. Before you leave the house today, look in the mirror and see what you are wearing. If it is not the armor of God – you are naked. Go put some clothes on – PUT ON the armor of God!